We love this awesome tribal Mudcloth Stencil for furniture! Inspired by traditional mud-painted African textiles, this ethnic stencil fits perfectly into modern interiors with nomadic, global traveler flare. You can use this tribal design for painting your furniture or for various craft projects. Mudcloth tribal patterns have been popular for a while now and our detailed tribal stencil is right on trend. This tribal design is created by stencil designer Janna Makaeva and is exclusive to Cutting Edge Stencils. While it takes an experienced artist to create a stencil, stenciling is an easy painting technique that doesn’t require any artistic ability. As long as you can hold a brush or a roller, you’re pretty much good to stencil a wall! We also offer this Mudcloth stencil pattern as a large stencil, perfect to be stenciled in a living room, dining room wall, in a bath, or as a stunning accent wall in your bedroom. Please check out our Mudcloth Wall stencil. 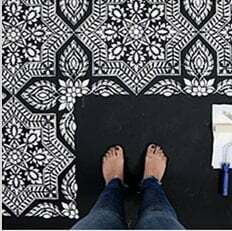 Consider using a mudcloth stencil for wall painting instead of purchasing costly and difficult to install (and remove!) mudcloth wallpaper. For stencil repeat instructions please refer to the step-by step photos above. This wall stencil features an easy registration system, just use parts of the previously painted design to align the stencil, check for level and continue. This gives you a seamless "wallpaper" look. Don't worry about super perfect alignment: in the end your eye will never notice the discrepancy, especially with this easy to use, forgiving stencil pattern! You can stencil with craft acrylic or wall latex paint, metallic paints, fabric paint or glaze. Don't use oil based paint or spray paints - these can make a huge mess! It's best to stencil over a flat/eggshell sheen painted surface, as flat paint is more absorbent and prevents smearing. Use a dense foam roller or stencil brushes for stenciling. Although our stencils do not require the use of spray adhesive, some stencil patterns could benefit from it to help minimize paint seepage, especially if your walls have a slight texture to them. (Elmer's spray adhesive seems to be one of the the best). Make sure you shake the can well and lightly mist (not drench) the stencil, and let it dry for a moment before positioning it on the wall. This step will prevent the adhesive residue transferring to the wall. You'll need to re-mist the stencil after a few repeats. Note: you will still need to hold the stencil in place with a few pieces of blue painters tape! Adhesive by itself is not enough to hold the stencil on the wall. No need to wait for the paint to dry after each repeat: if you're stenciling over flat paint it dries almost instantly. Also, no need to wash the stencil after each repeat. It might take many, many stencil repeats for the paint to start accumulating on the stencil, and at this point it will need to be washed. Wash your stencil on a flat surface such as a cutting board or a cookie tray, and gently scrub it with a stiff dish brush under running water. Usually the paint washes right off. Soaking or even misting the stencil and letting it sit for a little while can help to loosen the paint. Note that some chalk paints or multi-surface acrylics are much more adhesive than regular latex wall paints, and they might require additional soaking time to loosen the paint. After washing the stencil, pat it dry with a roll of paper towels. Adhesive clean-up tip: Spray the stencil with Simple Green to help to remove adhesive residue. Please note that once you've used spray adhesive on your stencil, it will never really come off completely. That is why we personally prefer not to use adhesive, and instead we use less paint on our roller or stencil brush and always off-load extra paint on a folded paper towel.